I’ve had trains on the brain for the last couple of weeks now. It all started with a conversation I had with my grandma over Christmas, and after seeing yesterday’s newspaper featuring our new president on that swanky old train car, I figured I’d better just get my locomotive ya-yas out and write a little something about it. Maybe there’s a future for trains and cheese? 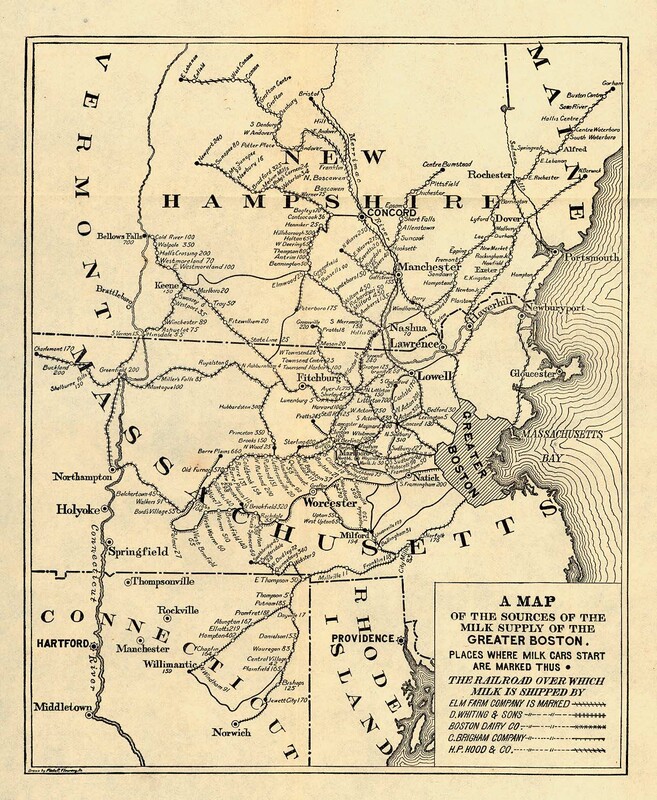 Seems a bit pie in the sky, but in these new times, you just never know… The picture above is a map, circa 1901, of Boston’s milk supply by railroad. I tried to find one for New York but was stymied. All I know is, if Boston’s was this far-reaching, New York’s was labyrinthine! Milk and trains are inextricably linked in the history of dairy and cities. My grandma June, who grew up on a small farm near Racine, Wisconsin recounted stories of getting up at the crack of dawn with her grandfather to deliver cans of milk to the local train depot. Her motivations were two-sided, loving the time spent with her grandfather, but also relishing the stop off at the local general store on the trip home for a double dip (that’s right, double!) of ice cream for breakfast. And all this before the clock struck 7:00 am… I (and my mom) now know who to blame for our freakish love of ice cream. From the late eighteen hundreds to the 1930’s and 1940’s, milk trains were the commonest way of supplying urban populations with milk. As cities grew, and farmland in and around them diminished, urbanites began depending more and more on milk from the country. Milk trains were so important and vital to the urban food supply that they often took precedence over passenger trains and frequently caused backups and delays on various lines entering the city from upstate and Connecticut. It is rumored that milk by ferry was tried, and abandoned, for the simple reason that milk lacks sea legs… the jostling of the boat would churn it into butter. So where did our milk trains come from? Milk was shipped to New York City from the far reaches of New York State, New Jersey, Connecticut, and Vermont, averaging a distance of about 250 miles by train, but sometimes nearing distances of up to 400 miles away. Before dawn in small towns all across New England, farmers would bring their fresh milk (in milk cans) to their local train station or depot. In some special cases, if the farm was far from a town but near to a rail line, the farmer would leave the milk at a ‘milk stand’ which was an elevated building next to the train tracks where the milk cans could be easily schlepped into the boxcar. Milk trains were cooled by large chunks of pond ice (harvested in the winter and kept in thickly insulated buildings for use in the summer) and kept the fragile delicacy intact for its journey to the city. In New York, the ‘milk yard’ was located at 60th Street on the West Side, and the creameries (responsible for pasteurizing and bottling the milk) were located as close as possible to the rail yards. There were creameries in the Bronx and Brooklyn as well, but the largest and most impressive operation was a company called Sheffield’s, who set up shop literally alongside the rail lines at 60th St. The milk would arrive in the city around 11:00 pm, be pasteurized and bottled by 2:00 am and sent out for delivery either to dairy stores or on local milk routes. By the 1940’s, the trend in milk supply shifted from trains to trucks, as the cost of transport was cheaper. Inexpensive fuel coupled with not having to maintain tracks, trains, and other expensive equipment soon made moot the tradition of milk by rail. However, there are inklings of this tradition coming back to life… A few years ago an economic feasibility study was done upstate New York with the intention of linking Catskill dairy farms to the city by rail. Maybe President Obama wouldn’t mind putting a little dairy caboose on his inaugural train?? If you haven't read "Milk: The Surprising Story of Milk Through the Ages" by Anne Mendelson you may get even more of your ya yas going with her stories of milk in NYC. Also, she's interviewed in EdibleManhattan this Jan/Feb issue. Let's hope for the best with rails & Obama!!! Change is on the rails!!! Thank you for the very informative post. I passed it along to my daughter’s preschool in Manhattan as they are making a special study of trains this semester. I just wanted you to know that when I stopped by yesterday, the head teacher took me aside to tell me that she had not only shared your post with the class, but that the three, four and five year olds hadn’t stopped talkng about it yet. Thanks again.